Husband and wife team Mike and Karen Tempest started brewing from their Berkshire- based premises in December 2012. Wild Weather Ales’ range has evolved significantly over the years and they now produce a wide range of styles packaged in to cask, keg and colourfully-branded cans. 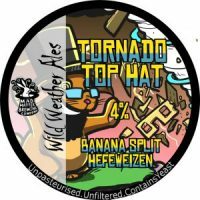 Wild Weather are known for their accessible fruited sours and love of hop-forward pale ales. Their 12-barrel brew house works hard to keep up with demand and the small team, based in Silchester, also share a love of performing live music. Their brewery events are not to be missed! 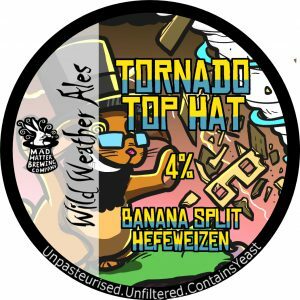 Brewed in collaboration with Liverpool’s Mad Hatter brewery, Tornado Top Hat is described as a Banana Split Hefeweizen. The trademark banana esters from the German wheat beer yeast are amplified by adding banana throughout the brewing process. This is a full-bodied beer delivering flavours of banana, cream and chocolate. The recipe uses a jungle’s worth of fresh bananas, milk lactose and chocolate syrup for bottle conditioning priming. The yeast used adds to the body and delivers the residual sweetness. The fermentation starts fast and finishes slow. Primary fermentation should be left for around 10 days until a stable final gravity has been reached. NOTE: This recipe requires 325g of banana pulp to mash before sparge, and 975g of banana pulp and peel for secondary, and chocolate syrup, these are not included in the kit.